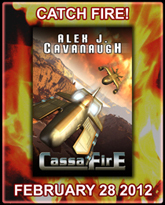 Alex J. Cavanaugh: CassaFire’s Release Day and Second Tour Stop! Congratulations Alex, Savour the moment of today. You deserve all the good luck the Good Lord sends you. HAPPY PARTY TIME ALEX J CAVANAUGH! Alex, MASSIVE CONGRATS on the book's release! I wish you all the best and hope you sell a million! The buzz around the blogosphere is testament to all the love and friendship that people feel for you and your work. PS to my earlier comment. Daniel is singing an appropriate party song hope you like it. CONGRATULATIONS, Alex! Hope you have a fantastic release day! It is a pleasure to be the host for today. Let's have a big blast! Congrats to the winners...of course a big one to you. Congratulations to the winners. Also, a big congrats to you, Alex. I hope your launch day is spectacular! This is so exciting!!! Congrats!!!! I'm so excited for you! Best of luck with CassaFire, and congrats to the winners! And he's off in a cloud of anti-matter particles! Congratulations Alex! All the best with Cassafire! Congrats Alex! So excited for you. And you're doing a great job spreading the word about your release. Massive congrats, Alex! Hope you have a party-licious day - you deserve it! And congrats to the winners as well! After clearing away a whole bunch of back reading I could finally justify buying a heap of ebooks. One of them is CassaStar! You now have a reader in Spain! Happy release day Mr Ninja - congratulations and I hope you have a fab day! Congrats to the givaway winners too - you lucky soandsos! Kitty, you and Mevine just drink yourselves silly. Jai, thank you, and yes it is amazing. Edi, ready for a big blast! Thank you, everyone. Now to go visit about two hundred blogs today. The big day is finally here - congrats! Congrats, Alex! I think it's a great day to you. Enjoy every moment of it. Congrads Alex! Happy day, my bodacious friend. Your army loves ya. Now go and have loads of fun. Congrads to all the winners too. COngrats Alex...soooooo excited for you. I posted on your release today. Not sure if I signed up or not...hope what I did is OK.
Congrats, Alex - enjoy your big day! Best of Luck... to the stars and back today... I know I am part of the Book Tour, but in my own special way...special. I gave you a shout out and a post... with that hidden interview that gave me last year, but you all are going to have to come to me... Muhaha. How exciting today is! Congratulations on seeing your hard work be rewarded! I hope you do really well, Alex. I plan to buy your book today. Great party Alex! Best wishes for continued success! Good luck! You are all over the internet today. I love what you did with your blog background and the book trailer is cool. Very professional looking. Congratulations and all that jazz. You'll do great. Couldn't happen to a nicer blogger. Congrats Alex!! This is so awesome! I hope you have an AMAZING release day!! Proud to be a supporter of the Ninja Captain! Now obediently heading to Edi's to check out your interview. Love the idea of your characters interviewing you! This is wonderful news, Alex! It's been too long since I've been by your blog. It's great to see how much you've got going! Wonderful and exciting, Alex. I hope you sell a TON of books. You rock. Congrats, Alex!!! You are on fire (see what I did there?? :) )! Congratulations! Have a rockin' release day! I raise my glass and cheer you on for continued success. Sounds like an awesome interview. On my way. Jeremy, thanks for posting on both of your blogs - really appreciate it. Zan, thanks for stopping by today! Thank you, everyone - wow!!!! Congrats Alex, enjoy the party! Congrats, Alex!!! Enjoy your release day!! Congratulations Alex! I hope the launch is successful and you are the #1 Bestseller. You are already #1 Blogger. P.S Now have CassaFire on my Kindle, and as planned, I cleaned up my post to make the hyperlinks "pretty" I hadn't had time for before this. Still wishing you all the best. Loved the interview with Byron and friends. Was that your idea, or Edi's? Tina, that was all Edi's idea. Thanks everyone! I am really overwhelmed. Congrats Alex. Enjoy every moment of this wonderful launch day. You really deserve lots of success. I find you so encouraging and supportive of other writers and bloggers. Praying that your books top the bestseller list for months. GO ALEX GO! FIRE AWAY! You deserve every bit of it! Congrats again Alex! You still give me hope, and how awesome is it to win something just for helping out a friend? Thanks! When you get the time, just let me know what info to send you. I can't wait to read your book! Congratulations on the release, Alex! I hope it's a huge success!!! Alex, so happy for you on this celebratory day. You so deserve all the success coming your way. Woo Hoo! Big, big congratulations! So exciting! Rachna, that would be awesome! Cool! And Congrats! to the other winners of the Blog Party Giveaways! Best of luck today, Alex! So happy this day is here. Too much fun to watch the internet Catch Fire! Launch? Space? You're not leaving us today, are you Cap'n? Thanks God for you Alex,you are bless,congrats,and keep up the great work. Your book trailer is awesome! Congrats on having your book come out! Congrats Alex, and I love the book trailer! So cool! What an exciting event! What an exciting day for you. Congratulations to all the winners. Congratulations, Alex! And your book trailer is awesome. :) Enjoy your day! Happy release day to your undoubtedly awesome sequel!! Congratulations! well, he should have got an oscar for Apocolypse Now. so when is the third book coming out? You've come a long way, my friend. Two books down already. That's flat out insane! Keep pumping them out! Budd, first I have to write it! Jeffrey, I'm working on it. Congrats on your big, big day! So excited for you! congrats on the release. i know you worked long and hard to get to this day. Off to read the interview! A great big HUGE congrats to you Alex!! And congrats to the winners of the book :D Here's to many more of these blog release parties!! CONGRATS! A-Day is here and CassaFire will be burning. . .
Nice to see all the support flowing your way, Alex. Good karma is nice. Now I've got to order my copy today, and maybe CassaStar, too. Alex, you set the whole blog world on fire. It's in ashes...sheesh. Congratulations Alex, I guess today will be a great day for you. I wish you much success and good luck CassaFire for you. Looks smokin' man! Big congrats! It's official, Alex. You've taken over the world. Your kick off party is off to a great start! Congratulations, Alex!!! Have an amazing day!!!! Congrats to the winners! Great party so far Alex. Looking forward to reading your book! Congrats! So much fun :) Good luck my book launch buddy!! Hope the launch is going well. Hilary, already have the outline for the third book! DG, thank you, I'd be honored! Jessica, may we both have an awesome day! Andrew, if your sidebar is full of my book, then you aren't left out. Thanks everyone - this is crazy!!! Congratulations, Alex!! Will order the book now! Congrats, Alex! I can't wait to read CassaFire!!!!! Congratulations Alex. You are such an inspiration. you have so many devoted fans! i didnt have much to read cause everyone is at your party! Congratulations, Alex! I've got my copy and I'm looking forward to reading it! LC, I am having a blast! Jessica, I did, didn't I? Tara, made for easy blogging today, didn't it? Congratulations good sir! The new book sounds even better than the first. And I might add that coffee cup looks snazzy. Big Congrats Alex!!! CassaFire sounds amazing, so happy for you :) Thanks for the giveaway, congrats to the current winners, and best wishes to the other entrants! Your party is going really well, Alex - it's everywhere I look on blogs, twitter and facebook. Dang B&N. I'm still waiting . . .
Well done, Al. Very well done. Congrats, Alex. You deserve a grand party!!! Congratulations, Alex! I wish you much success! Alex -- Per usual, I messed up and didn't post all the info regarding CassaFire that you'd sent. Mea culpa (I'm such a crappy blogger!). But anyway I've updated my post to include more official info including how to buy your splendid book. Congrats on the release of your book! So exciting that you have 2 out! BIG FAT CONGRATULATIONS! So excited and happy for you! I'm throwing all kinds of virtual confetti. Party? Did I hear someone mention a party? I loved that book trailer so much I put it on my blog post today. Perfect length, interesting, and a great way to sell the story. Nice job, Alex. 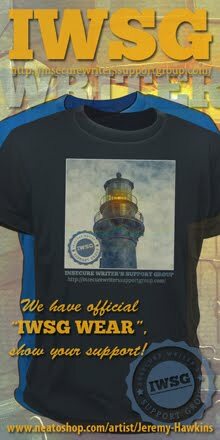 TS, fancy the mug, do you? This thing is huge today! Beautifully done. Congratulations. Congratulations Alex, you deserve this. Good luck with the book. Congratulations too, to the winners! forgot... cool trailer vid ! Your talent, tenacity, and cyber-charm will ensure profitable sales of the highest order. You are, I say without hyperbole, a paragon of inspiration for those chasing their dreams. I commend you. Today was EPIC! I have my copy of CassaStar ready and waiting for me! Woot! I couldn't be happier for you, Alex. I've seen you everywhere today in the blogosphere. Good luck during this wonderfully frantic launch. Roland, it's in the top one hundred of science fiction at Amazon right now! I just saw it at #89. Ali, that is so awesome. You rock! Thanks, everyone. I'm exhausted but very happy right now! Huge congrats to you, Alex! Congratulations, Alex! I love the book trailer. Alex, I don't know what to say...I am proud to have been one of your winners on your Blog Party Giveaway! Totally unexpected but something I will enjoy with pride. Again, I am totally stoked to read this book and can't wait to get into it. I am dead serious that you need to shop these two books around for a movie deal...winning a invite to a movie premier with you would be a sweet deal! Now there's incentive for ya!! Thanks again and much success on this release! Thank you. Congratulations Alex!! Awesome book trailer. Hope you had an awesome release day and have fun on the blog tour! CONGRATS, Alex! Happy release day. Best wishes for a very successful tour. Chuck! So cool you won. I knew you'd been trying so hard. Thanks my friend. Happy Fantastic Fun Day to you!! I know you are crazy excited and I hope you sit back and enjoy the feeling of this day! Congrats on this exciting day! And congrats to the winners! Congratulations Alex!!!!!! I wish you the best of luck! :) I'm so excited for you! And congrats to all the winners too! Man Alex,you sure know how to throw party. You are everywhere today. Couldn't happen to a nicer guy. Best wishes. Oh my gosh Alex, this is so great and so uber excited for you! Can't wait to read this sucker!!! Congratulations! What an achievement! I hope this book does even better than the first and I can't wait to read them both! A huge congrats to you, Alex. I loved the first book and am so looking forward to reading this one at last. Wishing you all the very best. You deserve all the praise and the kind words from your followers, lap it up and enjoy! Congratulations AleX! Congrats to you and the very deserving winners. I was going to guess Tango and Cash. My favorite line: Relax. Soap. And don't flatter yourself! Peewee. Boo! I didn't win. Dagnabit! Catherine, no - you are now entered because you commented! Cassie, I hope you enjoy it. Angela, I will drink to that! Lynda, I think with a female character you will really enjoy it. Mina, you might win the prize package though. Thank you everyone - launch day was awesome! Congrats on CassaFire. Looks like you have another epic tale on your hands.